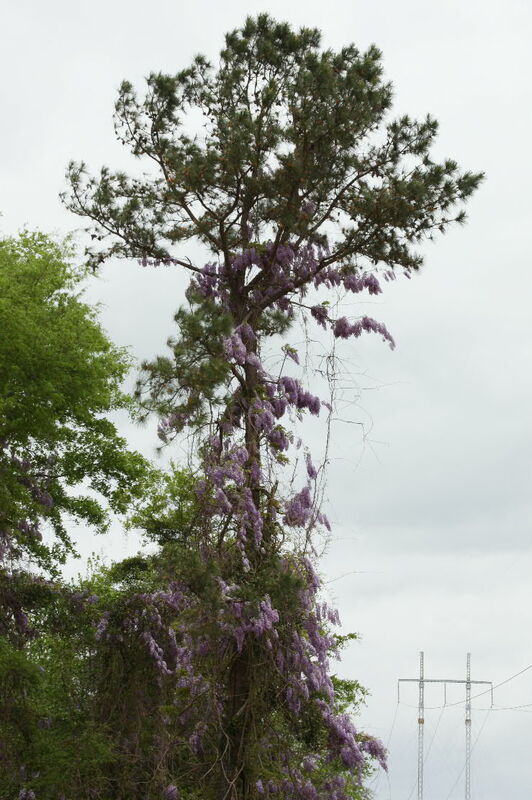 Wisteria, Purple and White Death | The Southern Home Bestuary: Living with our critter friends and enimies. The Southern Home Bestuary: Living with our critter friends and enimies. Old home site completely overgrown with several acres of wisteria-choked trees and brush. 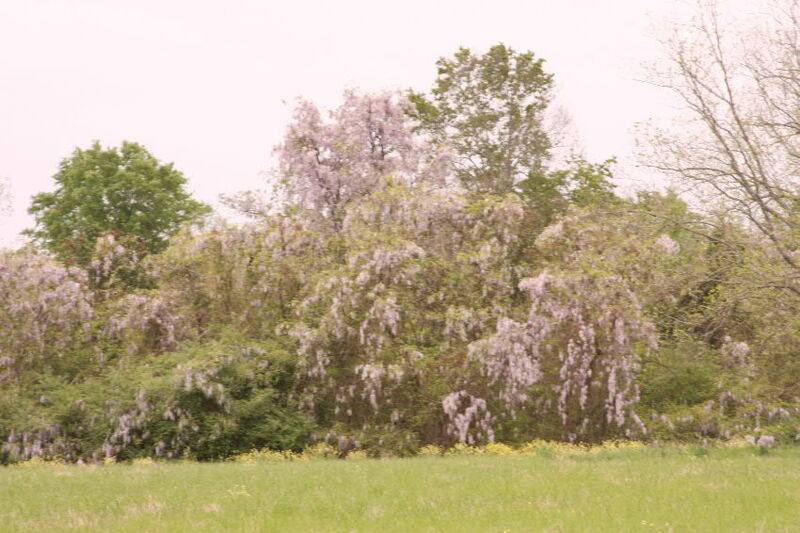 One sure way to locate old home sites in the South is to look for escaped and invasive purple globular clusters of wisteria blossoms hanging from the trees. This vine was brought in as an ornimental plant from China by the mid-1800s and has been planted around homes every since. Purple death on pine tree. The blossoms come on in profusion for a few days in the Spring (early April in my part of GA), and then the vines proceed to take over homes, forest, lawns and anything else that they can climb on. They kill trees by choking them to death as they wind around the trunks and also make them more likely to lose limbs during winter storms because of the added ice and snow that clings to vines. Although the purple variety from China already had a very stong start, a white variety from Japan is also grown. This has also gotten out of control, but the older variety is more common. It is not that we did not already have enough viney things in the Southeast with briers, honeysuckle (another import), kudzu (another import), blackberry vines and a host of others. Oh, I nearly forgot about poison oak and ivy. We have them too. Burning, poisoning, chopping and mowing will control its spread, but nothing but relentless hand pulling over a period of years will keep even a small piece of ground clear of the pesky plant. 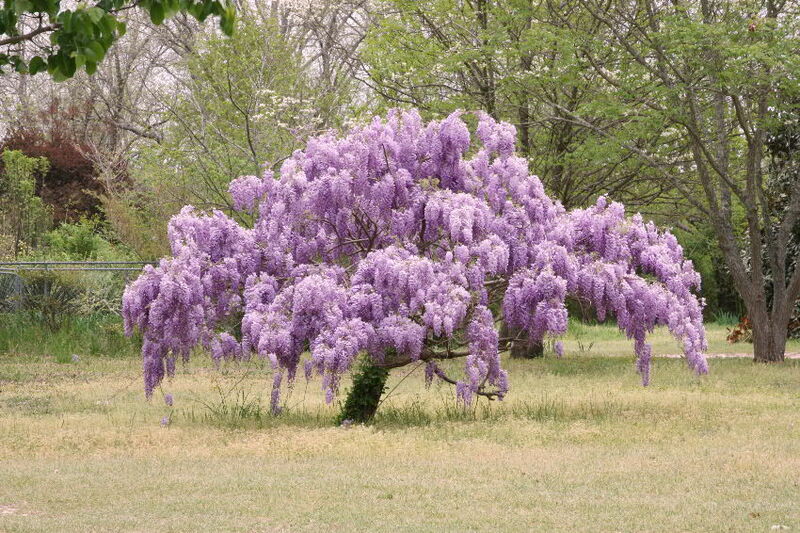 Plant wisteria as an isolated tree in mid-lawn and be relentless about prunning limbs and roots. If you must plant it, plant it as an isolated bush in a clear patch of yard and trim it relentlessly. When you feel that you can no longer tend the plant properly, have it killed. Even so, it will take a couple of seasons follow-up to insure that you were successful. We have this plant now, but need no more of it.